Now that Valencia CF has failed to sign any of the central defenders it has followed and were top priority the club finds itself with no good options for the center back option and Llorente has said to Emery and Braulio that they must be convinced by a CB in order to sign and that he would not waste money on potential flops. While I must say that there were too few candidates at this particular moment that fill all of Valencia CF benchmarks I've kept coming across Twente central defender Douglas Franco. He is a defender of great quality and a lot of strong sides have tried to buy him over the last 3 years, including top Dutch club Ajax. 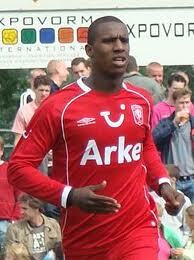 He will also come cheap as his contract with Twente ends in 2012. So with only a year left on his contract Twente would be willing to sell if Valencia CF can manage to convince the player to come. He has certainly talked about the possibility of leaving if a big club from abroad comes and Valencia CF is a big club. And thirdly he is young, only 23 years old and has enough quality and potential to be a long term solution to our defensive problems. He has certainly been rock solid in defense for Twente and I don't see any reason why that won't be the case at Valencia CF. Born in Florianópolis, Douglas began his career with Joinville at the age of 16. He joined Dutch team FC Twente on trial prior to the 2007/2008 season, playing his first match in a friendly against Borussia Monchengladbach on 7 September 2007. Douglas made his competitive Twente debut on 22 December 2007, coming on as a 90th minute substitute in an Eredivisie match against SC Heerenveen. His first start came on 23 February 2008 against AZ Alkmaar, in a 0-0 draw. Douglas Franco is currently valued at 8 million euros by transfermarkt.co.uk but remember he only has one year left on his contract and if Valencia CF was willing to give 5 million for Mangala who although quite talented was playing in quite a weak league and he probably would have had troubles in Spain with the technical play the attackers exhibit. Douglas on the other hand plays in the Dutch league, one of the most technical leagues in the world, second only to La Liga. Ajax as you all should know has been playing the "Barca" type possession football for over 20 years. So he will feel right at home in the Spanish league and wouldn't have any troubles adapting. Again I don't write these things lightly and as seen already all the players I've suggested in my "who should Valencia cf buy" editorials all of the players prices have jumped over a period of only few months. For example Ireneusz Jeleń from my winter transfer article price has increased from 4 million euros to 5.5 million euros and Leighton Baines has gone from 7 million euros to 17 million euros in value. I suspect the same will be with my summer transfer recommendations and in a way it has already happened with Benedikt and Maximiliano Pereira who had a fantastic Copa America run with Uruguay and became champions. So there you have it Braulio Vasquez your new transfer target and now you need to go watch some of his matches , make the assessment and get down to business and sign this player.